STAMFORD — A contingent of Stamford representatives from across the political spectrum are voicing their displeasure with a proposal to add tolls to the state’s highways. They introduced a resolution Monday night opposing a toll system; it will be discussed Feb. 21 at the city’s transportation committee. Rep. Steven Kolenberg, a Republican, is one of the co-sponsors on the bill. 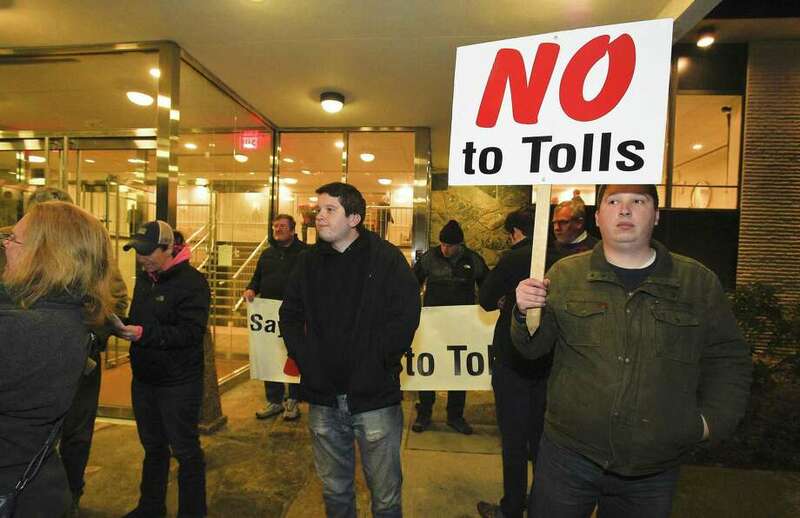 He said he has joined members of the grassroots group No Tolls CT in the past to protest the idea of adding gantries to Connecticut highways to collect tolls on drivers. The resolution was co-sponsored by Republican representatives J.R. McMullen, Dennis Mahoney and Bradley Michelson, and Democrats John Zelinsky, Jeffrey Stella, Denis Patterson and Ines Saftic. State Sen. Alexandra Bergstein, D-36, recently submitted a bill in Hartford to allow for the return of electronic tolls in the state. Bergstein’s proposed bill would install tolls on the main highways and set per-mile fees for cars and trucks that are comparable to surrounding states. It would require that the money be deposited in the state’s Special Transportation Fund and in a proposed infrastructure bank. Her idea is to use funding from the tolls to improve train infrastructure, including a 30-30-30 plan, which seeks to decrease the travel time between Stamford and New York City to 30 minutes, while also decreasing commuter time to 30 minutes from Stamford to New Haven, and from New Haven to Hartford. Bergstein, a Democrat and Greenwich resident, represents the 36th Senate District, which includes Greenwich and parts of Stamford and New Canaan. She has argued that funds raised through a toll system could be used to repair crumbling infrastructure throughout the state. The end goal: faster commute times and less time stuck in traffic. But opponents aren’t so sure tolls are the path to achieving that goal. Kolenberg, for example, isn’t confident the money accrued from the system would be spent wisely on transportation. “This is just going to wind up hurting regular folks who are going to work,” the Republican said. Kolenberg added that tolls would send more drivers onto Stamford streets, having a negative impact on local travel. Many of his concerns have been brought up by protestors in meetings recently hosted by Bergstein. But for Stella, a Democrat who represents Stamford’s West Side, the toll issue has little to do with party affiliation. His district is overwhelmingly Democrat, and he said his constituents are very much opposed to tolls. He said a toll system could deter people from traveling into Stamford to go shopping or to eat at one of the city’s many restaurants. Originally from New York, Stella remembers paying $300 in tolls every month for a mere 10-mile commute.